Rescuers help an 80-year-old woman who had been trapped in her home along with her grandson. 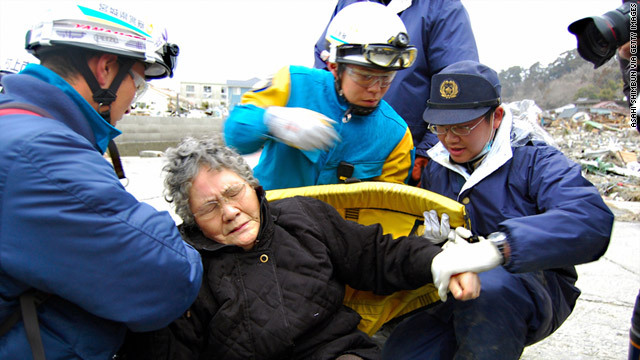 (CNN) -- A grandmother and her teenage grandson were rescued Sunday in Japan, nine days after they became trapped in their home following the earthquake and tsunami, officials said. In the southern part of the Miyagi city of Ishinomaki, the 80-year-old woman and 16-year-old boy were rescued by medical workers, authorities said. Police were searching for survivors in the vicinity. The boy managed to crawl through the rubble onto the roof, the Ishinomaki police department said. A relative had reported the two missing on March 13, police said. Police gave the specific location as Kadonowakimachi, in the southern part of Ishinomaki near the coast. The news gave hope to others that their missing loved ones may be found alive. Along with emergency workers searching the worst stricken areas, specially trained dogs are taking part in the effort. "There's a lot of technical gear, obviously: the listening devices, the cameras, all of them help to locate people. But at the end of the day you can't beat a dog for hitting the scent of a human being," Rob Furniss, a British canine search specialist who is in Japan, told CNN. The dogs are so highly trained, they're able to block out the scent of a dead body and pick up only on someone who's alive. They pounce onto rubble, working their way along jagged, uneven piles as they search. When they get minor wounds in the effort, they get stitched up without a whimper, and soon get right back to work. But for many Japanese people, the search now is not for survivors -- it is for the bodies of their loved ones. In the town of Otsuchi, Keiko Chiba pointed to where she believes her husband's body may be. Even if he survived the tsunami, she says, a resulting gas explosion that burned through the town likely killed him. Akihito Yamaguchi, in the town of Kamaichi, lost his 71-year-old father in the tsunami. He had been holding onto his father, but the force of the waves were too strong. Both his parents washed away before his eyes. He survived when the tsunami's waters flung him against a tree. He showed CNN where he believes his mother is, in the rubble of the first floor of their home. He is not holding out hope to find them alive. But he told CNN he has a purpose left as a son: to find his parents, and bring them together.